Any season is a good season to sew, but there’s something uniquely satisfying about harvest kitchen quilting in Autumn! The charming motifs of pumpkins, acorns and fall vegetables combined with russet toned fabrics create such a wonderful coziness. I’ve found quick, inviting, harvest-time projects for you to sew and quilt today. Grab a cup of hot cider and settle in to plan! Acorns are a quintessential symbol of Autumn, so they’re included in our harvest kitchen quilting. 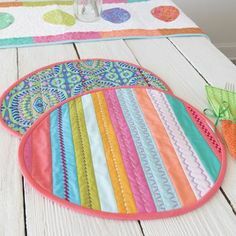 And, the patchwork potholder designed by the Amanda Niederhauser team for Therm O Web is perfect! 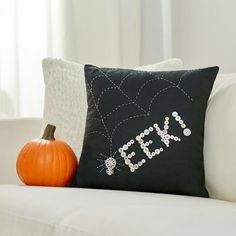 You’ll need just a few scraps of fall themed fabrics, a coordinating terry kitchen towel and fusible fleece along with coordinating thread. The mighty potholder design includes options for strip or square piecing. If your potholders need to hang, you’ll enjoy the instructions for an optional hanging loop! Make these for your own kitchen, but stitch up a few more, too. They’re perfect for harvest season hostess gift opportunities! Click here for the Patchwork Acorn Potholder tutorial. Fruits and veggies are just right for our harvest kitchen sewing. Especially when they’re stitched into super gorgeous potholders! Designed by Carol of Calico Bass Quilts, you’ll quickly see why her handy helpers were a Quiltmaker design contest winner. Carol’s versatile vegetable appliques will delight your Fall quilting heart and spark harvest joy in your kitchen. 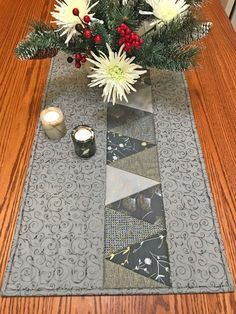 The free downloadable pattern also includes bonus instructions to use Carol’s designs for a four block table runner or a 16 block wall hanging. This is an impressively well thought out tutorial that includes a three page Basic Lessons section. So, these veggie-fabulous designs are excellent for beginners, too! Click here for the Veggie Projects tutorial on the Quiltmaker blog. 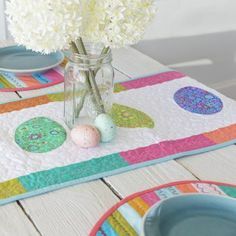 On the Martingale Publishing blog, I found a book excerpt with marvelous harvest kitchen quilting pizazz. Designed by the authors of the book,’Tis the Season, the post includes an apron, coasters and lovely kitchen towels. 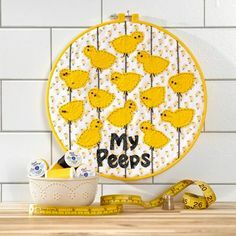 These simple, yet clever designs are created with fusible applique, then hand or machine blanket stitched are added for an outstanding finish. 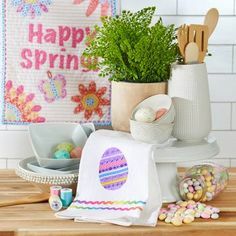 You’ll sew up the apron and coasters “from scratch”, and use purchased towels to complete the set. I loved their simple, well laid out cutting instructions and the marvelous rick rack edging used on the designs. There’s a super helpful rick rack edging technique video that you’re going to love, too. And, as if charming quilting wasn’t enough – there’s a Bran Muffin recipe included! Click here for the Harvest Spice Trio tutorial on the Martingale blog. Mug Rugs are popular and fun to make, gift or use! 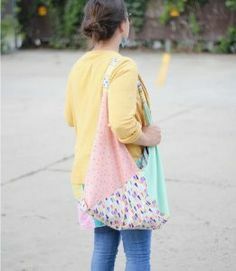 Sher of Sher’s Creative Space designed this adorable version for a Mug Rug of the Month series on the Sew So Easy blog. To create a more harvest-style design, just leave the kitty and ghost off and add a few more pumpkins. One of the joys of mug rugging is the small amount of materials needed. 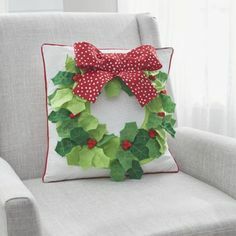 This darling project uses just a few scraps, backing fabric and fusible fleece and web. 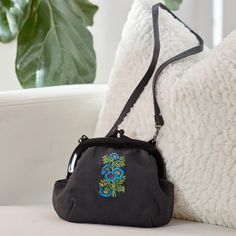 There are suggestions for embellishments and you can choose hand or machine stitching for the finishing. The instructional details in this tutorial are very impressive! Sher includes plenty of tips and techniques you’ll find yourself using for future quilting projects, too. It’s really more like a course in applique than just a mug rug post! Click here for the Pumpkin Patch Mug Rug tutorial. Potholders, runners, towels, coasters, aprons! There are so many ways to fall into harvest kitchen quilting and invite the wonders of autumn into your handmade home. 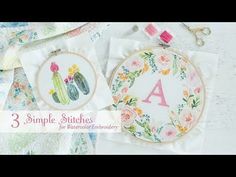 Enjoy your harvest stitching and be sure to make a few extras for gifting, too! 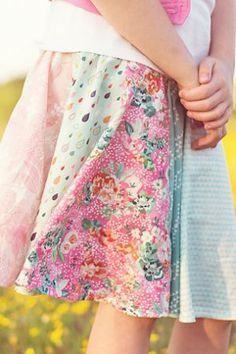 Annette Millard began sewing at the age of three, made her first dress at ten and is always happiest with needle, fabric and thread in her hands. Annette feels very privileged to have spent most of her work life in the sewing industry and loves teaching, making her own handmade wardrobe and writing about sewing. She spent over ten years as the newsletter and web site content writer for the Pacific Northwest's largest locally-owned family of fabric stores and is now thrilled to have the opportunity to share her passion for sewing with the Sewing Secrets community. Follow Annette and more of her sewing adventures on her own blog, www.sewfullife.com.